Pasquale Romanelli was born in 1812 and was a pupil of Luigi Pampaloni and Lorenzo Bartolini in Florence. He took over Bartolini’s studio after he died. He became a very prominent sculptor creating many public monuments in Italy. He exhibited his work in both Paris and London. The artist was extremely well known for his sensuous sculptures of allegorical, biblical and mythological figures of women. 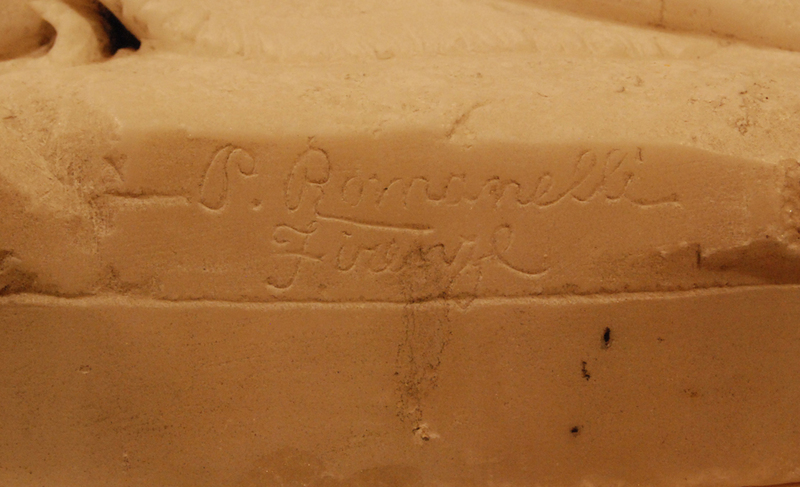 His son, Raffaello Romanelli and grandson, Romano Romanelli were also renowned Italian sculptors. 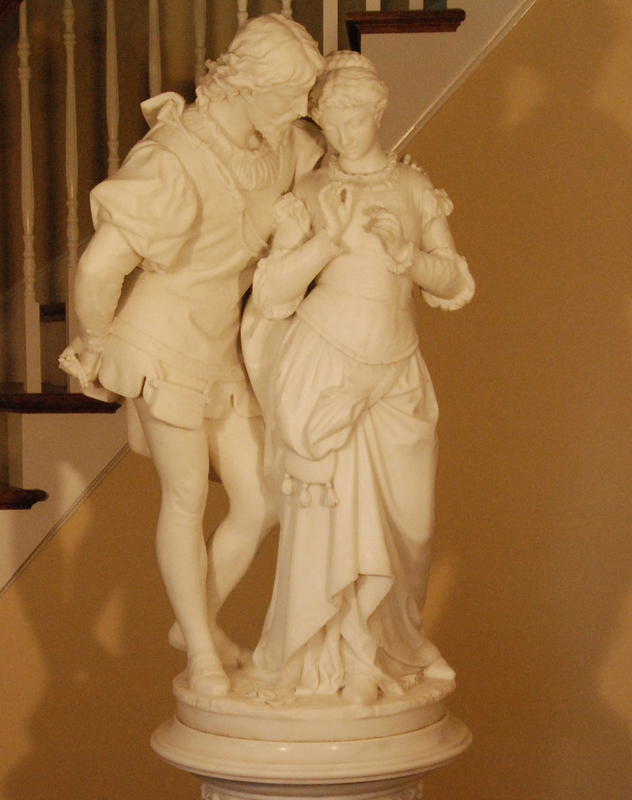 The Courting Couple was created by Pasquale Romanelli in Florence, Italy in 1880. It was made of Carrera marble. The sculpture measures 45”h x 21”diam. 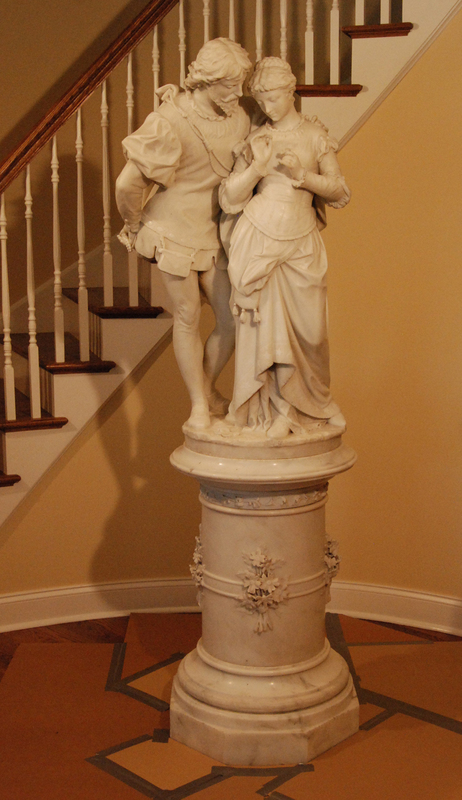 and the base was 36” h. The artist’s signature was carved in both the front and back bottom edges of the piece. The front reads – “Prof. P. Romanelli, Firenze,” and the rear – “P. Romanelli, Firenze.” The sculpture’s base was not signed nor dated. The surface of the marble was extremely dirty with some areas of oily residue. There were numerous small losses on both the top of the base and the bottom of the sculpture with several noted points of impact. 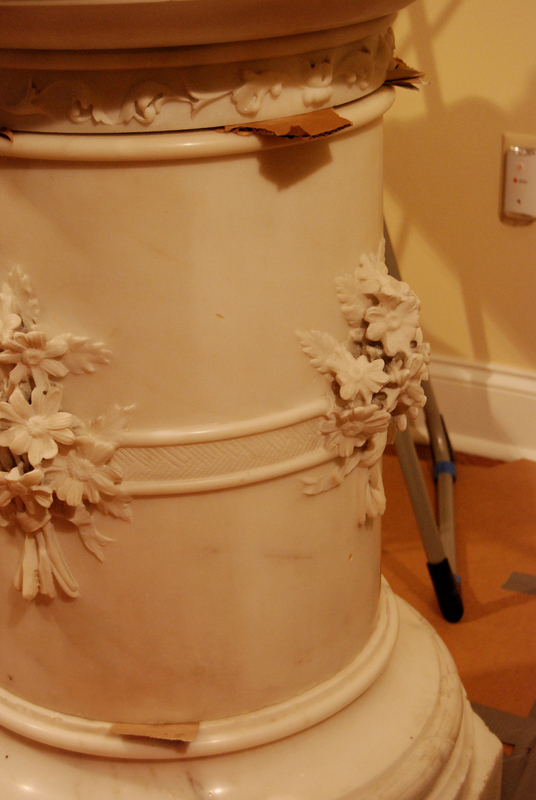 These edges appeared to have sustained damage each time that this very heavy sculpture was placed on top of its pedestal. The little finger of the woman’s proper left hand had been broken off and was repaired. The adhesive used had yellowed and was quite noticeable. A 2 1/2” x 2 ½” piece of marble was missing from the lower proper right corner of the man’s cape as were five petals of the flowers on the base. There was evidence that someone intentionally applied paint to the man’s groin and the woman’s proper left armpit. 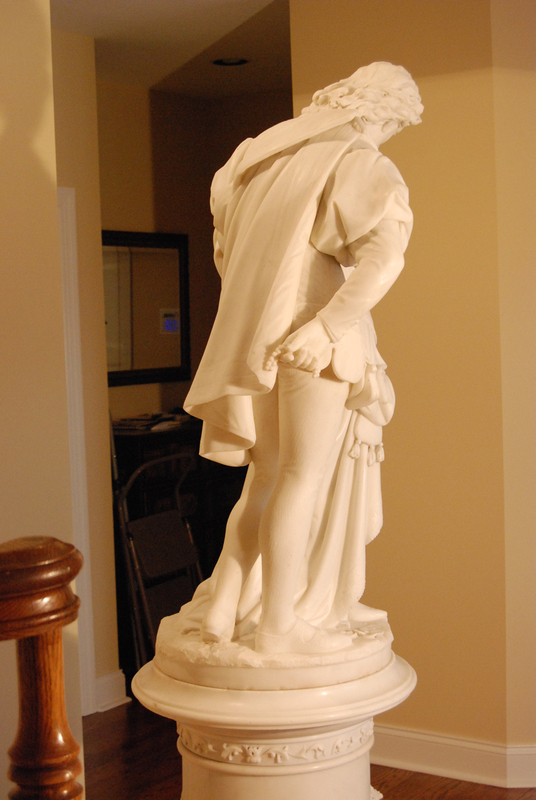 At one point the lower ¼” of the base of this sculpture was cover by floor tiles. A ring of mortar was still present around the base. The treatment was documented with written report and digital photography before, during and after treatment. All surfaces were brushed and vacuumed, and then cleaned with Magic Erasers pads with deionized water. Heavily embedded dirt in small recesses was removed using mild detergent and cotton swabs or carefully with dental picks. The surface was rinsed with deionized water. All paint splatters and accretions were removed mechanically with a surgical scalpel. Paint-like staining on the man’s crotch and buttocks, and the woman’s armpit was removed with organic solvents followed by a concentrated detergent, and rinsed with organic solvents. It was necessary to loosen some of the paint with a scalpel. The mortar was carefully chipped off of the bottom of the base. Remaining mortar was removed with hot deionized water. Several small dark inclusions in the marble and the yellowed adhesive on the woman’s repaired finger were inpainted using conservation grade paints. The owner chose not to have the missing flower petal or the man’s broken end of the cape repaired at this time.